I don’t make yeast breads often, so was very pleased with myself when my Sally Lunn bread turned out well. This wonderfully light, brioche-like bread, made either as buns or as a cake, is really not difficult at all, just time-consuming. Legend has it that it was named for a young French Huguenot girl, Solange Luyon, who sold the buns on the streets of Bath, England, in the 1600s, and whose name was Anglicized to Sally Lunn. Another theory is that the name comes from the French soleil et lune, meaning “sun and moon,” from the shape and color of the buns. 1. Scald the milk in a small saucepan over medium heat, heating it until it begins to steam and small bubbles appear around the edge. Remove from heat, add the butter and sugar, and stir until the sugar is dissolved. Let the mixture cool to lukewarm. 2. In the bowl of a stand mixer, whisk together 2 cups (10 ounces) of the flour and the yeast, salt, and lemon zest. Add the milk mixture and the eggs. Using the paddle attachment, beat the mixture at medium speed for 4 minutes, or until well combined and smooth, scraping the bowl down as needed. 3. Decrease the speed to low, add the remaining 1 1/3 cups (5 ounces) flour, and beat until fully incorporated, about 1 minute. Switch to the dough hook, and mix at medium speed for about 5 to 7 minutes, or until smooth and elastic. The dough should look sticky and wet. 4. Scrape the dough into a large, lightly oiled bowl. Cover with plastic wrap and let sit at room temperature for 1 to 1 1/2 hours, or until doubled in size. 5. Butter a Bundt or regular tube pan (see abreadaday.com for instructions on using a 10-inch cake or springform pan). Turn the dough out onto a well-floured surface. Knead the dough a few times, beating it down, and form it into a flattened round ball. Poke a hole through the center of the dough, making a doughnut shape. Place in the greased pan around the center stem, pressing down a bit. Cover with plastic wrap or a tea towel and let rise at room temperature about 45 to 60 minutes. Before baking, preheat the oven to 425°F, and position a rack in the lower third of the oven. 6. Bake the bread at 425° F for about 15 to 20 minutes, until golden-brown on top. Ten minutes into the baking, tent the top loosely with aluminum foil to prevent over-browning. 7. While baking, heat the milk and sugar for the glaze together in a small pan for a few minutes, until the sugar has dissolved. When the bread is done and removed from the oven, gently brush the glaze over the top. 8. Cool the bread in the pan for 15 minutes, then put on a wire rack to cool completely. Slice into wedges and serve warm, with butter, jam, and/or clotted cream. 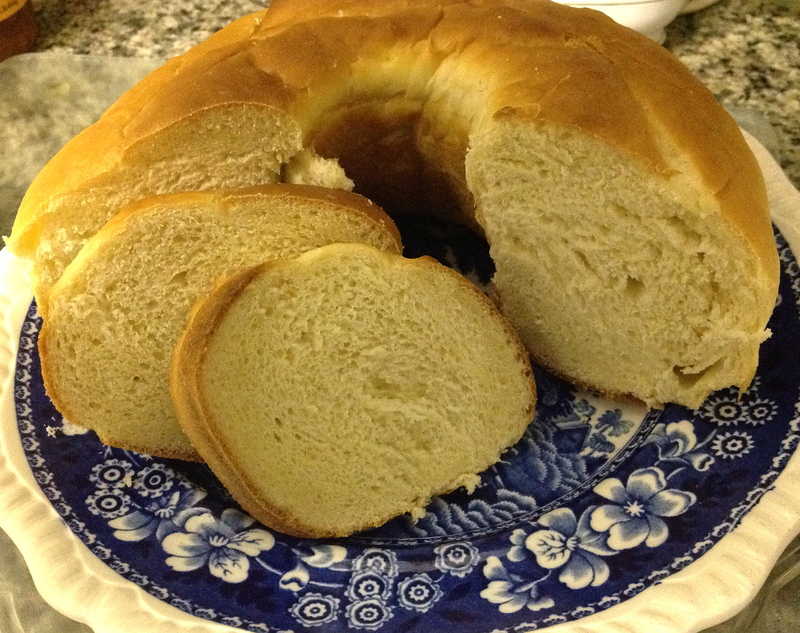 This entry was posted in breads and tagged brioche, colonial, Sally Lunn, yeast bread by revolutionarypie. Bookmark the permalink.